DILLON—Elizabeth Patience Alford McCutcheon, 85, died at her residence Wednesday, September 29, 2010. The family will receive friends from 4:00-7:00 PM, Thursday, September 30, 2010 at the residence, 318 Johnson Dr., Dillon, SC, 29536. Funeral services are at First Baptist Church of Dillon at 4:00 PM, Friday, October 1, 2010 with burial in Greenlawn Cemetery, directed by Kannaday Funeral Home. 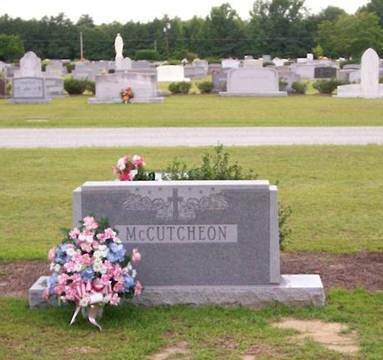 Mrs. McCutcheon was born in Florence County on June 1, 1925 a daughter of the late Ada Gertrude Williams and Sion Walter Alford. 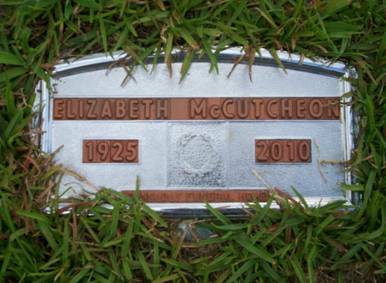 She was the widow of Mr. Owen Kenneth McCutcheon, and was a loving wife and mother. She was retired from Campbell’s Kindergarten, was a member of First Baptist Church in Dillon, was a former Sunday School teacher and member of the Alice Hobeika Sunday School Class. Surviving Mrs. McCutcheon are her son O.K. (Janet) McCutcheon, Jr. of Dillon, SC; daughters Anna Katherine McCutcheon (Danny) Bass of Dillon, SC and Elizabeth McCutcheon (Jim) Rozier of Myrtle Beach, SC; 10 grandchildren: Anna Kay Bass Mew, Sara Beth Bass Reaves, Daniel Bass, Kenlyn Bass, Kenny McCutcheon III, Eli McCutcheon, Ashley McCutcheon, Sam Rozier, Sallie Rozier, Kate Rozier and 8 great-grandchildren. She was predeceased by sisters Ada Williams Alford Bell and Anna Katherine Alford Hyman. The family would like to express a very special “Thank you” to McLeod Hospice and beloved care-givers Odessa, Sherron, Lisa, Brenda, Annie, Pam and Yolanda. Memorials may be made to McLeod Hospice, P.O. Box #100551, Florence, SC, 29502 or to First Baptist Church of Dillon, 400 N. 4th Ave., Dillon, SC, 29536. AAFA NOTES: SSDI records confirm the birth and death dates of Elizabeth Alford McCutcheon (SS# issued in NC), last residence Dillon, Dillon Co., SC. We included the obituaries of her parents, Ada Gertrude Williams Alford Arnette and Sion Walter Alford; and her sisters Ada Williams Alford Bell and Katherine Alford Spooner Hyman in South Carolina Obituaries. Her lineage: Elizabeth Patience 1925 NC1, Sion Walter 1886 NC2, Wiley Cherry 1852 NC3, Jacob 1789 NC4, James 1764 NC5, Jacob 1738 VA6, Lodwick 1710 VA7, James 1687 VA8, John 1645 VA9.